to instantly stop your dog’s bad habits. Walk in Perfect Pace with your dog. “I am amazed at how in five minutes, my unruly standard poodle was walking at my side without any issues!!! Walking my dogs had become a pain and an embarrassing chore since controlling both seemed seemed like an unreachable task. We tried harnesses and previous training methods without positive results. This leash made me a believer! I already placed a secondary order for my other poodle. I foresee lots of walks and trips to pet friendly stores! Thank you!” — Cindy S.
The soft woven version is made from a lightweight yet strong tube-like material with no hard edges, it is 3/8″ wide. A variety of colors are available! Choose REGULAR length (approx. 4 feet of leash), or LONG (approx. 6 feet of leash). 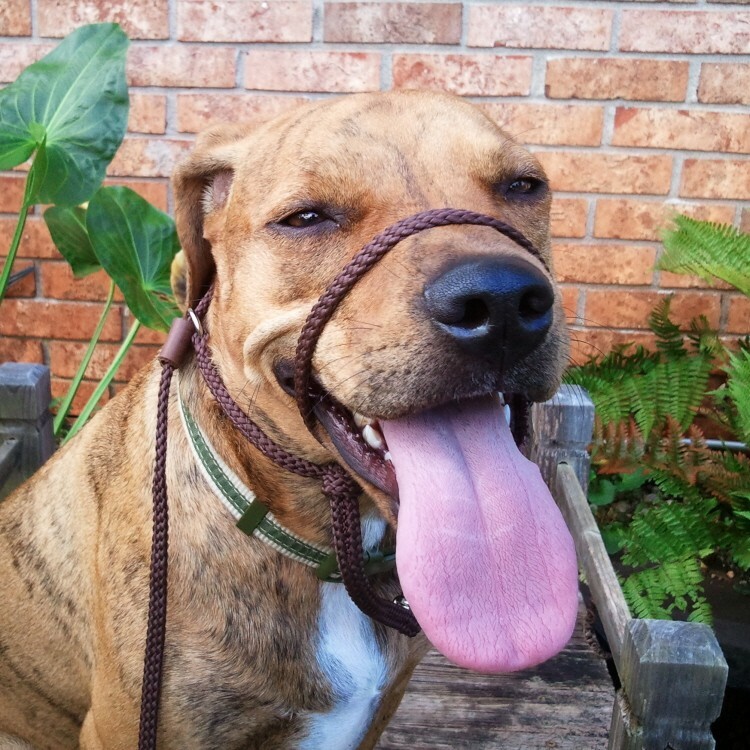 Actual length of the leash portion depends on your dog’s actual head/neck size. Leather is sturdier and more durable! Our flexible leather is the best quality you’ll find anywhere. The edges are beveled for a smooth feel. ONLY available in REGULAR length. All leather items come with our unmatched Lifetime Warranty. 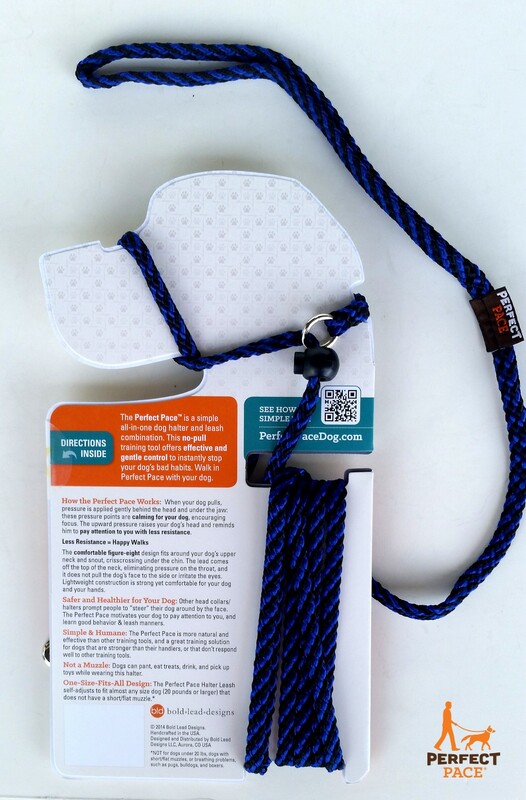 The Perfect Pace is a halter/head collar designed to stop your dog from pulling and lunging on the leash. 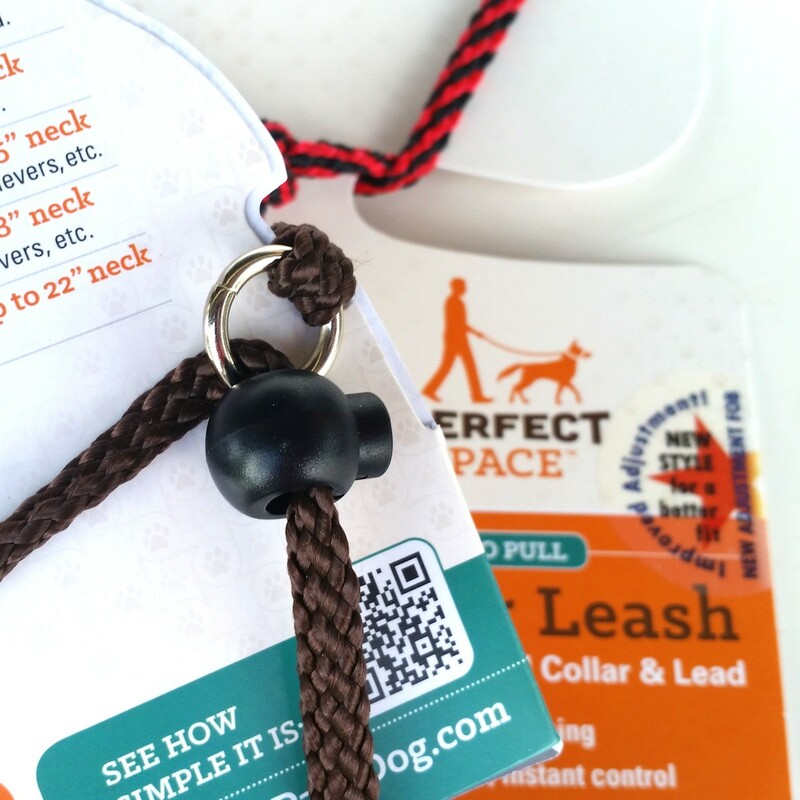 The comfortable figure-eight design fits around your dog’s upper neck and snout, crisscrossing under the chin. The lead comes off the top of the neck, eliminating pressure on the throat. It does not pull the dog’s face to the side or irritate the eyes. 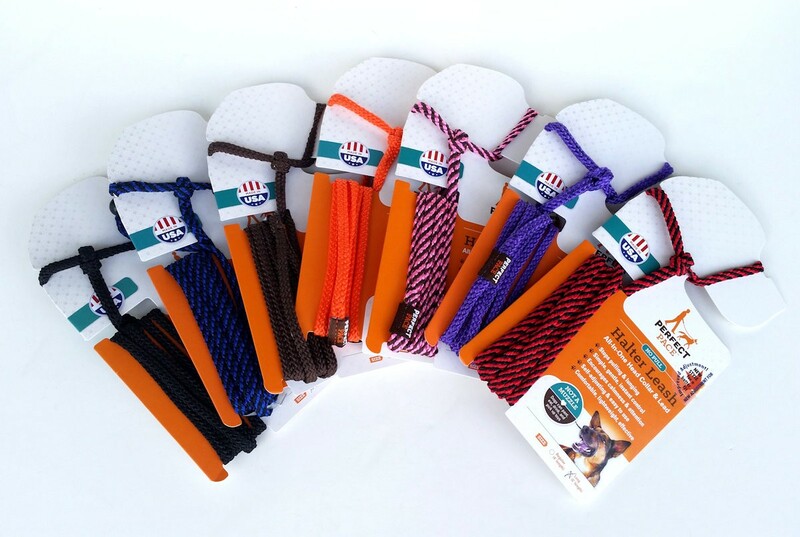 Lightweight construction is strong yet comfortable for your dog and your hands. How the Perfect Pace Works: When your dog pulls, pressure is applied gently behind the head and under the jaw: these pressure points are calming for your dog, encouraging focus. The upward pressure raises your dog’s head and reminds him to pay attention to you with less resistance. 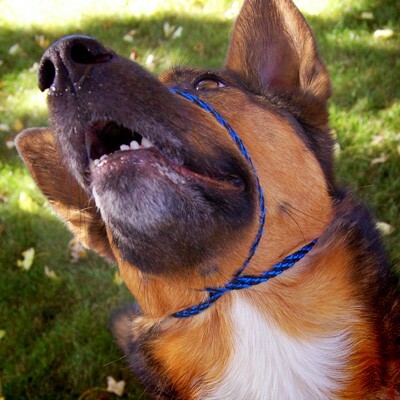 Safer and Healthier for Your Dog: Other head collars/halters prompt people to “steer” their dog around by the face. 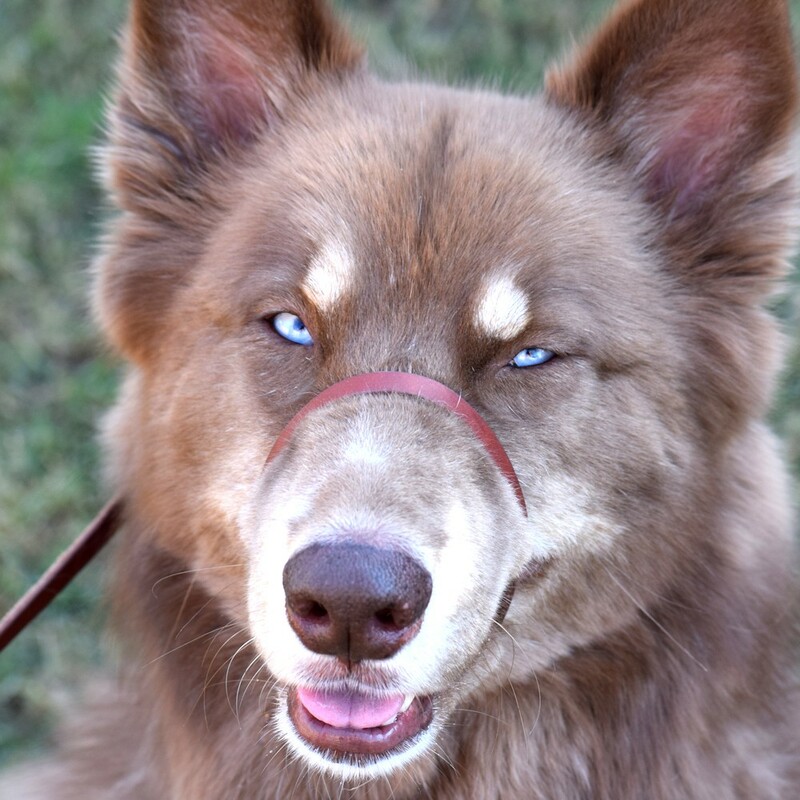 The Perfect Pace motivates your dog to pay attention to you, and learn good behavior & leash manners. Simple & Humane: For many dogs, the Perfect Pace is more natural and effective than other training tools, and a great training solution for dogs that are stronger than their handlers, or that don’t respond well to other training tools. 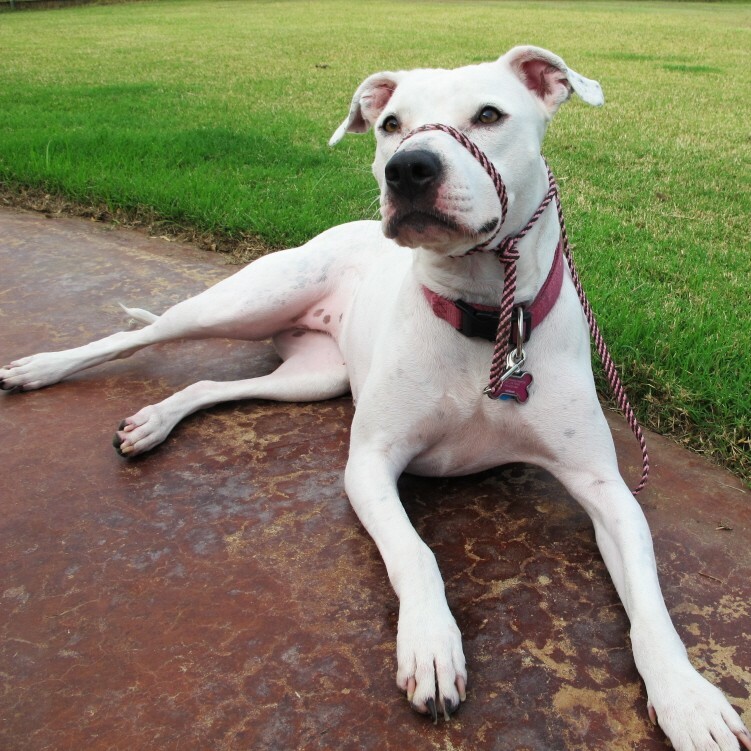 Many dogs prefer this style of halter because the leash does not dangle under their chin or force them to turn their head. The lightweight, minimal design is less annoying than other halters. 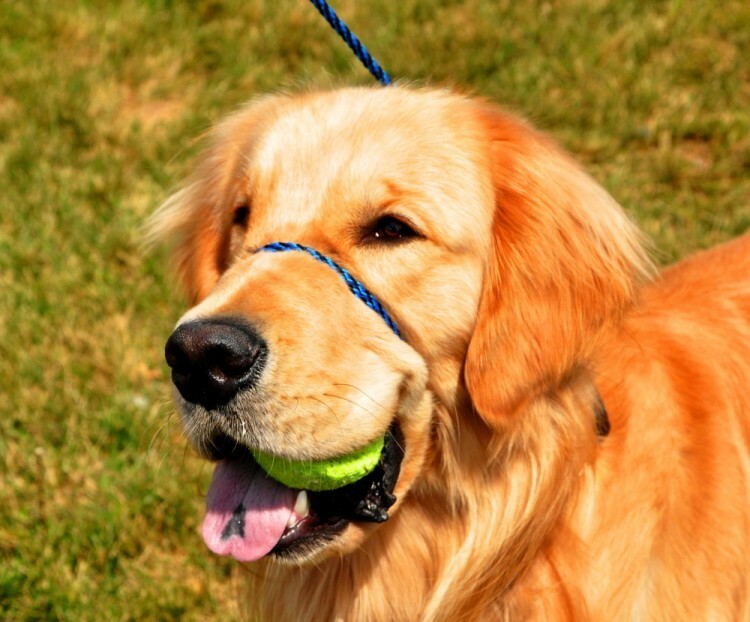 Professional dog trainers love this training tool because it is not aversive! For best results, we recommend using positive reinforcement training to desensitize your dog to the sensation of the halter on his snout before using this product. The novelty of “stuff on my face” can be distracting for some dogs, but with positive reinforcement, your dog can quickly learn to accept it! 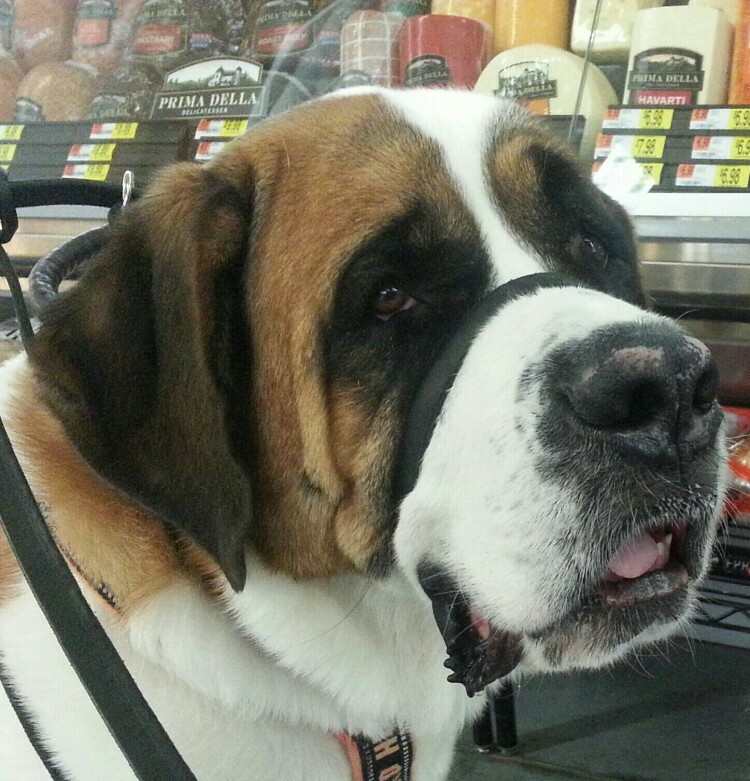 Not a Muzzle: Dogs can pant, eat treats, drink, and pick up toys while wearing this halter. 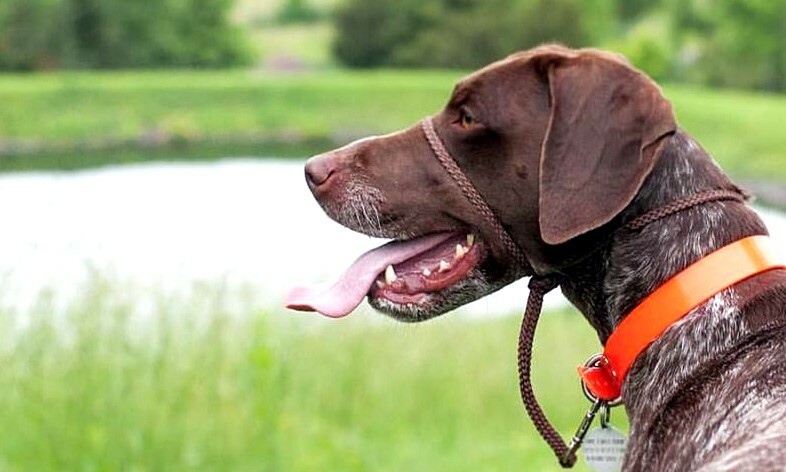 It Works Differently: Dogs that have struggled with other collars, halters, or harnesses often accept the Perfect Pace willingly and respond with calm focus and attention. If other training tools have not been right for your dog, try this one and we’ll stand behind it with our Satisfaction Guarantee. User-Friendly Package: your Perfect Pace will come with great instructions and links to helpful videos on PerfectPaceDog.com. Made in USA: Product is designed and handcrafted in the USA. Package is designed, printed, and assembled in Colorado. Woven material and tan leather is also American made! *NOT for dogs under 20 lbs. Recommended for medium and larger breeds (over 20 lbs.) due to the way pressure is applied. (brachycephalic breeds are more prone): consult your veterinarian if you have questions or concerns. Please read and follow the instructions and reminders in the package before using this product. Remember that no training device works on every dog. Any tool is only as good as the hands that use it. I have purchased two of these. My pup ate through one when he found it one day but the second one , I have had for over 3 yrs and still in use. My male pitbull staffy was a strong puller. (I’m only 4ft 9!!) And he would lunge at other dogs. With the perfect place collar/ leash combo I could safely walk him with one finger!! He was so responsive I couldn’t believe it. Now I use it on his son 3 1/2yrs old. Walking with this collar is a breeze. I actually don’t enjoy walking without it…getting.arms yanked out of my socket if a Weka runs out the bush, and constantly getting dragged behind him etc. This product is such a simple design but such an effective tool!! Thanks from us down under, in New Zealand! My fiancé and I have a Plott Hound that pulled so hard on a leash I refused to even walk her for fear she would pull hard enough she would get away from me. My fiancé had to take her on all her walks. This leash instantly helped with the problem. She barely pulls at all now. Such an easy solution. I purchased the wide leather leash for my mother, who has an eleven-month-old, 135 pound male Anatolian who she can’t control. The first few times we used it for walking, he didn’t like it. He’d roll his muzzle in the grass constantly to loosen it and take it off. Needless to say, we (meaning me) caught on quickly – if he gets on the ground, the head leash is going to come off. So, we pull him back up before he’d get the opportunity. We did this every time, and he never got it off again. My mother seemed to admire how better he was on the walks. Whereas he’d practically drag her all over the neighborhood and even yank her off her feet whenever he saw another dog, he was instead behaving very well. Because he couldn’t pull. I love this thing very much, but it seems that my mother is not interested in using it. I essentially wasted my money, but that’s no problem. If she doesn’t want to put the effort into having her dog wear it and ignore the fits he has (which will eventually dissolve, because they were beginning to after four days of wearing), then that’s her own problem. She seems to be fine with risking bodily injury twice a day. I’ll be keeping it for myself, and saving it for when I go back to volunteering next spring at the local humane society. I’ll also probably get another one of these at some point when I’m able to get a dog of my own. I am amazed at how in five minutes, my unruly standard poodle was walking at my side without any issues!!! Walking my dogs had become a pain and an embarrassing chore since controlling both seemed seemed like an unreachable task. We tried harnesses and previous training methods without positive results. This leash made me a believer! I already placed a secondary order for my other poodle. I forsee lots of walks and trips to pet friendly stores! Thank you! AMAZING TRANSFORMATION. . . I highly recommend!!! I have a rescue from the streets of Mexico. On a leash she practically crawled totally fearful of everything, tail between her legs, spinning and dragging me. Consequently walks were very stressful. Now using Perfect Pace, she is trotting along tail up and wagging. She is still a little apprehensive at times, but I am confident she will overcome her fears. THANK YOU SO MUCH!!! Perfect Pace has totally transformed my sweet girl. 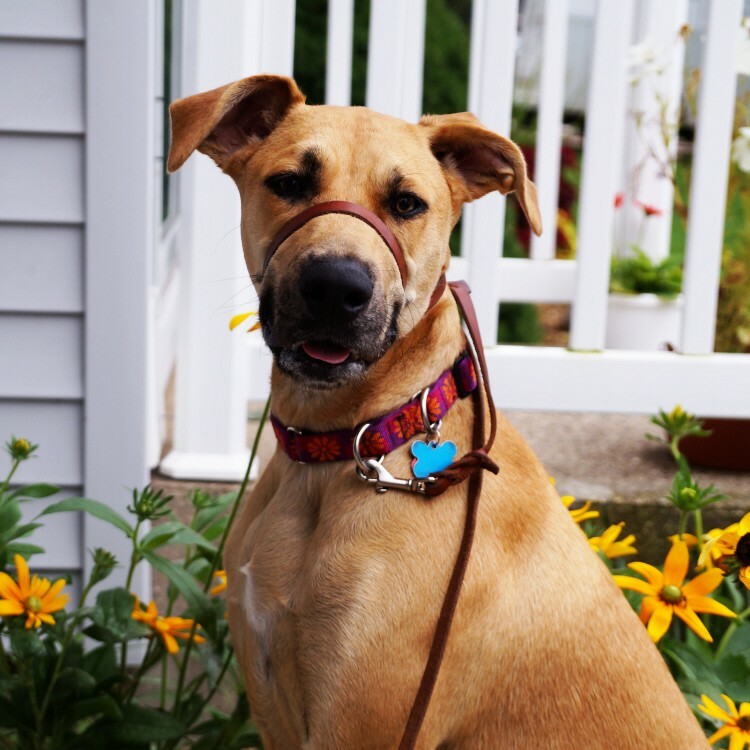 My husband and I are amazed at the difference the Perfect Pace No-Pull Halter Leash / Innovative All-In-One Head Collar & Lead has made with our dog, Abbi. Katrina offered advice, answered questions and order was placed! Our dog is reactive and halter/leash has made such a huge impact on our walks. She is not completely “cured” her of lunging at other dogs, cats, skateboards and bikes but, I would say a 95% improvement. This is much better than the Gentle Leader we have. Get one!!! Thank you. We were searching for a better option in terms of halters and happened to find this website. We have an 11-month old lab mix who was a BIG puller (we took him to several puppy/obedience classes to no avail). We go for 40-60 minute daily walks and Logan would pull, spin, and paw at the halter (getting it off more than once). I watched the video for the Perfect Pace halter and thought ‘using JUST your fingertips…no way’. Well, I certainly stand corrected. This is THE BEST halter we have EVER used! We can literally use our fingertips when walking our now perfectly heeling pup! 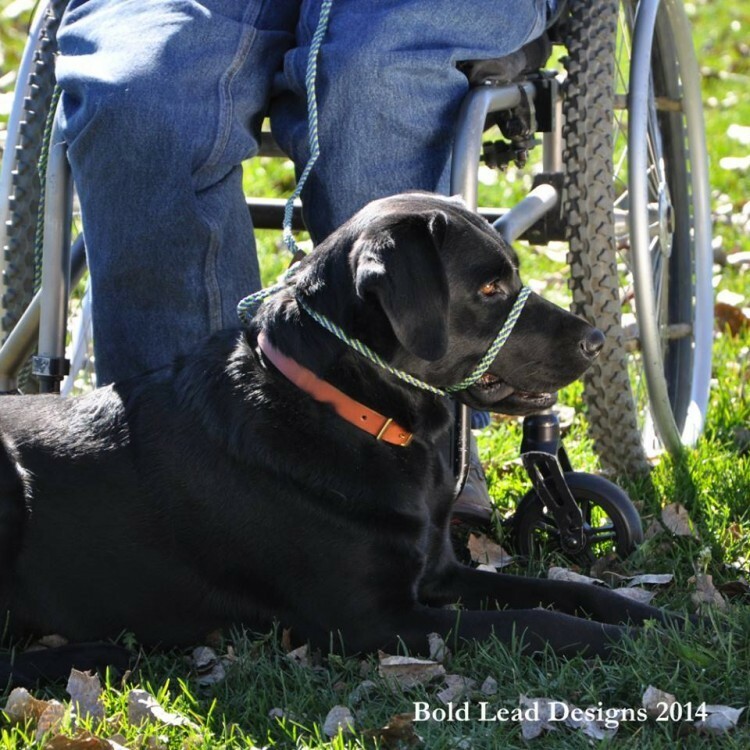 In fact, we ended up using a second one on our 8-year old lab…it was the best he has ever walked with us! We are back to by two more for the other pups we walk/train with!! I HIGHLY recommend this! 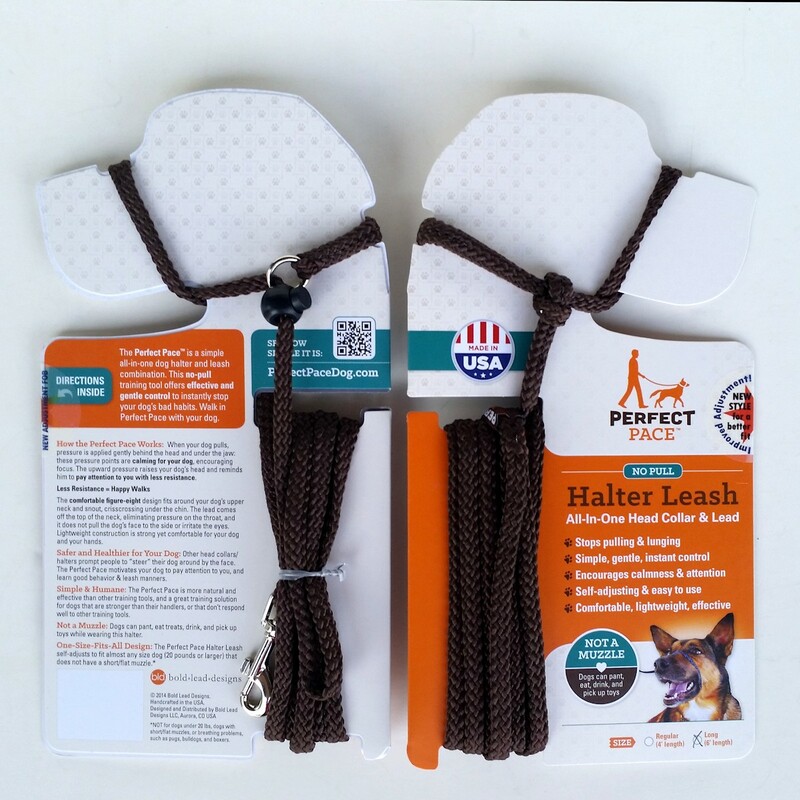 Just a heads up….this halter appears pretty flimsy and the packaging is not the best (this is literally my only complaint about this product) but it works so well you don’t need a big, thick leash (which is what we had been using). My boy Ben (border collie) stimulates to jumping and pulling in seconds when he sees something exciting. Body harnesses just seemed to make him think he was a dog sledder and would try to pull me as fast as possible down the street. I don’t have completely stable knees, so prong collar was out of the question. I was terrified I would fall on him and hurt him. Wearing a regular collar or Martingale collar he didn’t care if he choked. I was a afraid he would pass out. The Halti was better, but he couldn’t stand the dangling under his chin and it often slid up scruching his eye up. The Perfect Pace Halter was next, but because it was so light weight, I thought I would never be able to control him with that thin piece of rope. I was wrong, he has become much more calm and attentive. I did originally start with the halter and my own leash, not the halter leash combo. Ben didn’t really like it because the leash clip was heavy enough that the loop where you attached the leash would slide around under his chin. I ended up readjusting the loop to back behind his head repeatedly. 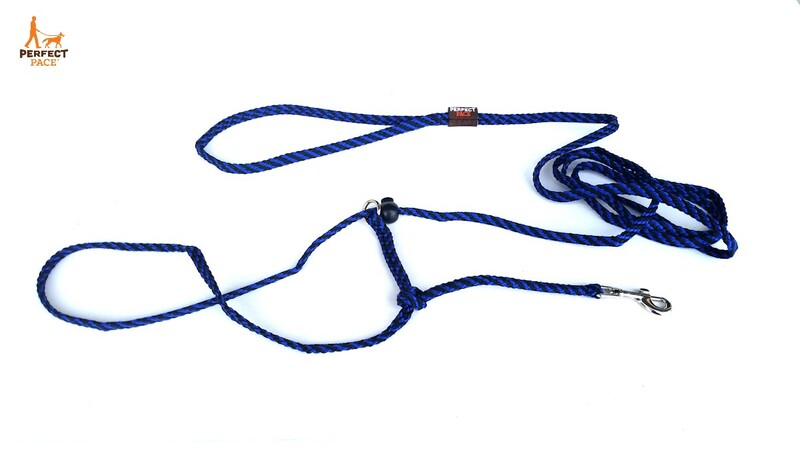 The combo halter leash has much less slippage and requires far less readgustments. Training your best friend is always a work in progress and I must say this product has really helped. I bought this in the leather version when it was called Infinity. 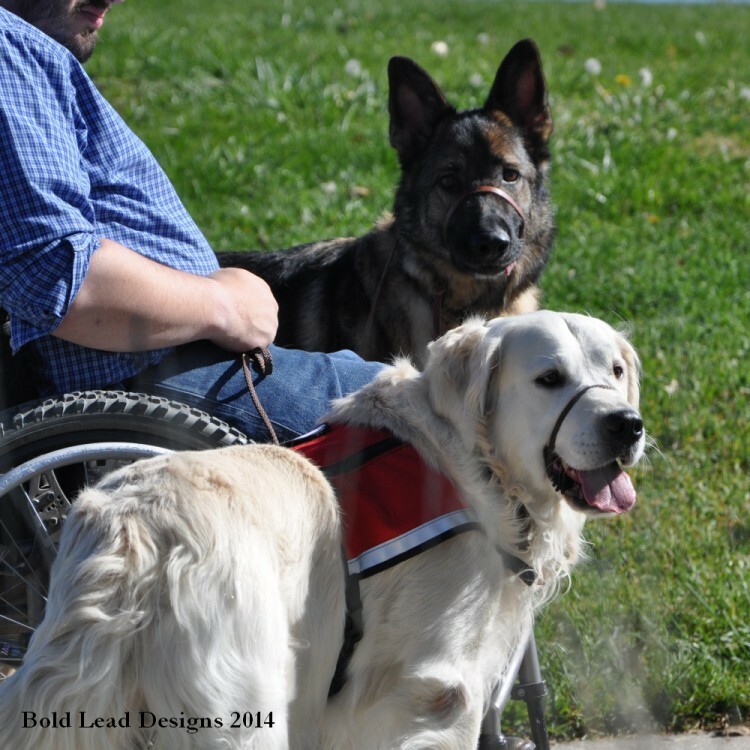 I discovered it at a perfect time when I was training my 90 lb puppy to be a service dog. This leash allowed me to have instant communication with my dog. Sometimes, even with Halti type collars, she would get mixed signals. I don’t think there is another product out there that does what this one does. As she learned more, I would turn it into a slip collar of sorts where I could quickly revert back if I was in a iffy situation. Although, I don’t use it now. I keep it handy in case there is an emergency situation where things would get confusing for her. 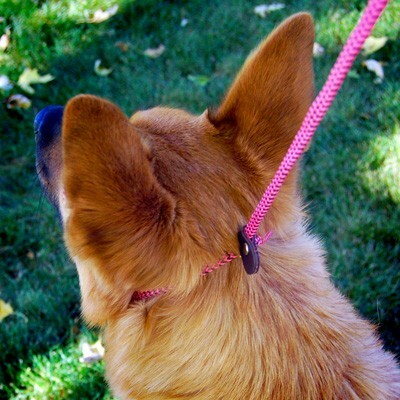 Finally, it is the most beautiful soft leash that you might never want to stop using it. 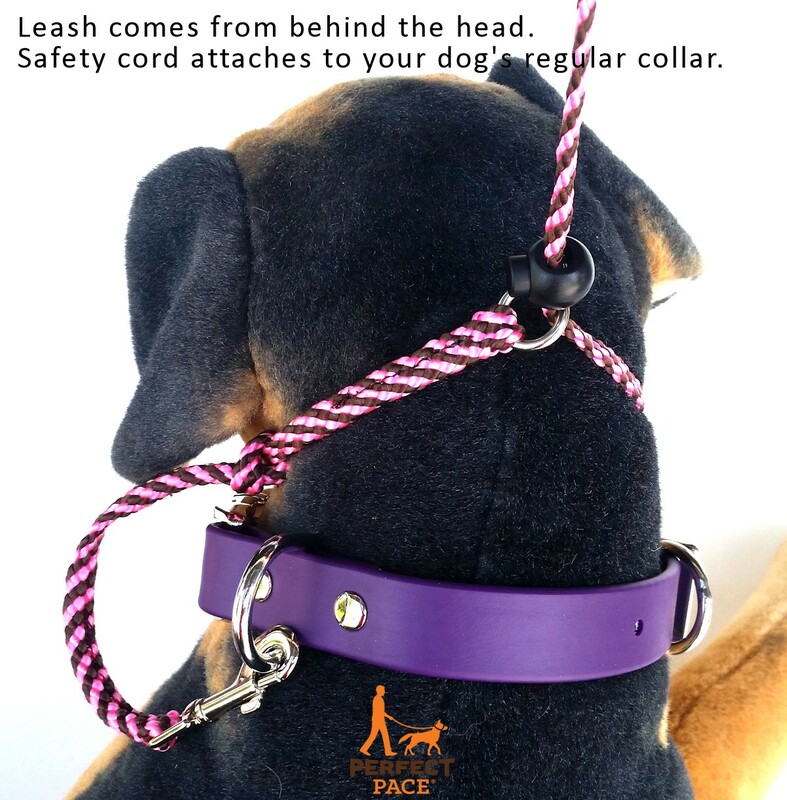 The Perfect Pace no-pull halter leash is by far the best head collar around (and the leash combo is an extra bonus)! Walking two energetic dogs put a lot of wear and tear on my wrists. They are both working/hunting dog mixes and even at their best behavior could easily bulldoze someone over with their strength. But that has definitely changed with this head collar and leash. I can now, literally, hold my dogs leash with two fingers and feel in total control. And a bonus is that my wrists no longer ache. I have tried other head harness but never liked the fit and my dogs always hated them. But aside from the occasion rub on the ground both dogs took to the Perfect Pace no-pull halter leash immediatly. I would, and have, recommended this product and have even had a dog trainer praise the design. I was recommended by a friend about your products. When I first viewed this leash online, I didn’t understand how such a thin halter leash could work as well as one I had previously bought. It was a bit chunkier and more invasive. Heavier too. Well, glad to find out how much it exceeded our expectations. First off, yes, it is quite thin and light. Which to me is a plus. We’ve had ours probably…3-4 months? Still in great shape. It’s withstood many uses including hikes/camping trip. I find it quite versatile too, because it will also transform into just a clip leash or slip lead if necessary. It’s super light – did I say that? You can easily pack it up into a very small space. Fanny pack approved! Also, it’s not as invasive on him, esp towards his eyes. He use to always paw at his old one every two seconds. With this one, he will have a rebellious paw moment once every blue moon, but not every two seconds. And most importantly, he walks like a complete gentlemen on this leash. We will definitely order our next one here. I bought these leashes for my dogs, a lab, a great dane, and a 65 lb mix and I love them. They used to drag me down the street and greeting everyone along the way. These leashes keep them in line and allow me to keep control. I can now put them on regular leashes and they walk perfectly. Thank you so much for these! I adopted my German Shepherd from a rescue shelter when he was 3 years of age. Whilst he was good at “sitting”, I don’t think he had been trained to walk on a leash. In addition to this, he didn’t get on with some other dogs. Since then we have done a lot of training and been to an animal behaviour specialist, but it is best if we avoid other dogs as much as possible. (He used to jump/pull whenever he saw a dog – and was extremely difficult to control). I tried several types of harness (shoulder-harness, head collar etc). The head collar worked best, but he started wearing the hair under his eyes (because he pulled so much). Then I found the Perfect Pace No Pull Halter Leash. It was so light-weight that I was concerned that it wouldn’t be strong enough. There were no issues at all. The material has not worn out. However, I’ve since purchased some others (and given two away – to a lady with a large rescue dog, and also to my sister). The people at BoldLeadDesigns have been very friendly and helpful. The postage is comparatively cheap, and the parcels are delivered (to Australia) promptly. I thoroughly recommend this product. I LOVE the Perfect Pace No Pull collar and leash!! I We call it THE MAGIC LEASH . We have 3 dogs that pull, pull, and pull when walking. We have spent what feels like a fortune on different collars,leashes, working backpack…and there has still been a pull. With the Perfect Pace No Pull……….truly works like magic on our 3 dogs. Now it is a pleasure to walk them. We can even walk them at the same time. Thank you Bold Lead Designs……..!! Hey Katrina, I wanted to let you know how happy I am with the perfect pace lead/head halter i bought. . . it’s brilliant! I’ve had dogs all my life and have had many training successes through the years. but I’ve bowed to the realization that the only dogs I’ve successfully “trained” in loose lead walking were those who wanted to do it anyway. The current 4-legged love of my life, an 80 lb. young choc. lab, is no exception to that and he’d become increasingly abusive on lead & body halter, a couple of times coming close to hurting me with his lunging behavior. I’ve tried everything over the years, including other head halters. I’d steered away from them primarily because i didn’t like the impression that they give: i.e., that the dog in the head halter may be a biter or aggressive in other ways. But I’ve been doing some T-Touch training and have been told that one of reasons the head halters work is that they apply pressure to a calming point across the nose – I haven’t verified this, but it got me to reconsider this gear. I was just about to head back to my trainer with Rufus and decided to try the perfect pace first…….it’s been a miracle. He doesn’t really like it, but he absolutely respects it and it has transformed our walks. Additionally it’s so thin that i’m not really concerned about the impression it gives. The integral system is very nice and convenient, but I have found times when I didn’t feel I had enough grip with the thin leash. I plan to get the head halter only so i can use my leash in these situations. Several folks have seen me use this gear and also been impressed so I hope word of mouth brings more business. Thanks for carrying this great product. Oh, by the way……I refer to this gear as my a**hole tamer. Finally, something that works on my 70 pound energetic hunting labrador! What sold me was that the perfect pace’s leash starts at the back of the head, so there’s nothing to weigh down my dog’s face or swing around under his nose when he walks like many other head harnesses. I’d highly recommend this to anyone with a dog that likes to pull – it saved me a good deal of tension in my shoulders. As a dog trainer I have seen my fair share of “no pull” harnesses, collars, leashes, and head halters none of which could compare to this! 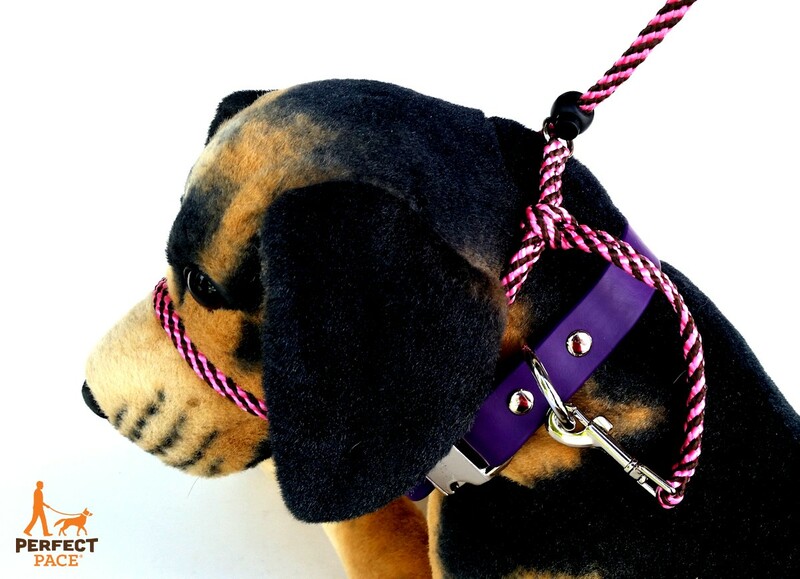 It provides a gentle reminder to the dog to pay attention to the handler and makes the word NO a thing of the past! I can better communicate with my SDiT and with my client’s rowdiest dogs. The colors are bright and cute and the material is soft and strong, I was worried the leather adjustment fobs would loosen too easily but when they arrived I was thrilled with the quality. I have tried other head halters but the dogs hated them and would learn to pull even with it on, not to mention they caused injuries to their eyes and snout. I recommend this product to all of my clients! I’m definitely impressed and that’s a lot for me to say since I’ve tried everything from a choke chain to the prong collar to the no-pull halter. I was SO close to getting the “generic” head collar from Petsmart before I decided to look online for a better alternative. First things first, Zelda is my 3.5 year old Doberman and she’s a huge puller. The prong collar worked for a little while, but she became conditioned to the “corrections” with no change in her pulling patterns. I stuck with it for a year or more since the prong collar was much easier to use on walks than just her collar. A few months ago, during a food run to Petsmart, I decided to grab a no-pull harness. And, with no surprise, it didn’t work. I thought it would eventually break her in, but it never did. Then, a few days ago, I googled “best no pull lead for large dogs” and this was the 3rd listing after the lupine no-pull harness, which seemed like it wouldn’t work with my dog, and the miracle leash. Though both were just as interesting as the Infinity Lead, it was the simplest out of all 3 in my personal opinion with no hassle about the size of the dog’s girth to match with the product. Today, when I received it in the mail, I immediately put on my shoes and put it on Zelda. She definitely didn’t like the way it felt and it’s understandable. The way the Infinity Lead worked is almost like a horse’s halter with less hardware. After her trying to get the lead off of her face and a few minutes of vain pulling, she finally fell into step with me! This was the first time in 3 years since she was a small puppy that she didn’t pull! I was ecstatic! She got used to it by the end of our short walk and followed me when I changed directions on the sidewalk by my house. She was even complimented as well-behaved because of her calmness on the lead! I was proud of her and I’m thankful for Katrina for having this amazing lead. The Infinity Lead is DEFINITELY a good buy! PS I bought the 6′ lead! Definitely loving it! We received the leashes today. One of our King Charles pulls like crazy and lunges at other dogs. We put the leash on and after some initial resistance we have had the best walk ever in over 5 years. This product is really amazing and does everything you say it will. I cannot thank you enough, it was a pleasure walking Sam today and we have you to thank. 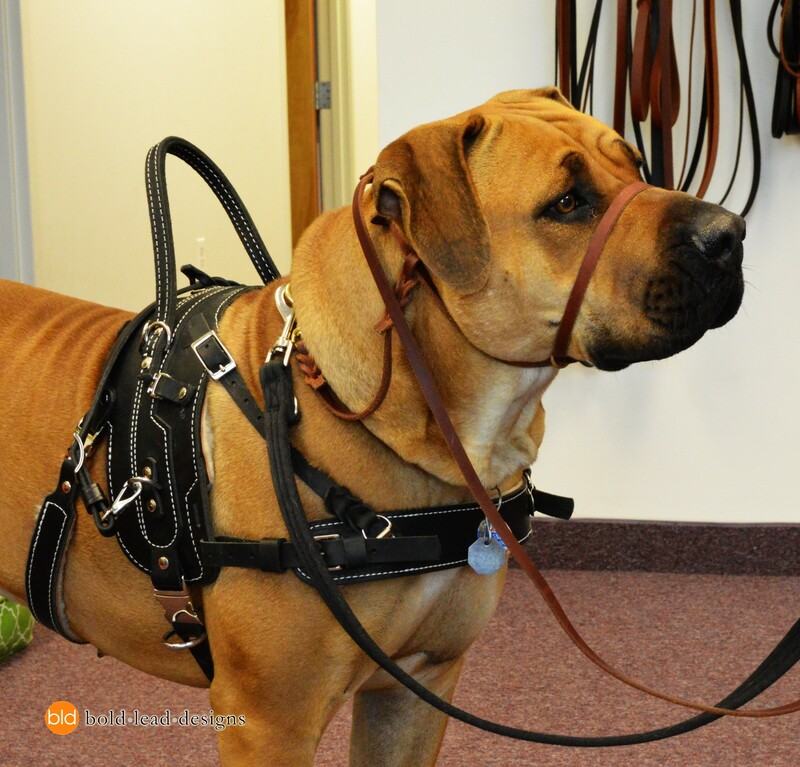 I don’t normally take time to write about something I purchased but the infinity leash has made my boxer mastiff dog a new dog to walk. I usually have rope burn with her old leash from her pulling so hard. I can actually walk her while I push my 3 year old in her little car at the same time. Thanks for coming up with this leash. Worth every penny. Thank u.
I’ve tried the gentle leader a few times. This leash has so many benefits above the GL. First, you don’t have to select a size. One size fits all, and you can fine tune the fit for your dog, very large or very small. Second, There is a “back up” if your dog happens to escape it, which has happened only once for us. Third, the dogs can’t learn how to pull with this harness. If you’ve used the Gentle Leader, you know what I mean. The dog learns how to apply pressure to it to pull. Fourth, very light weight. You’ll almost think it is a joke when you get the tiny envelope in the mail. I highly recommend this leash. 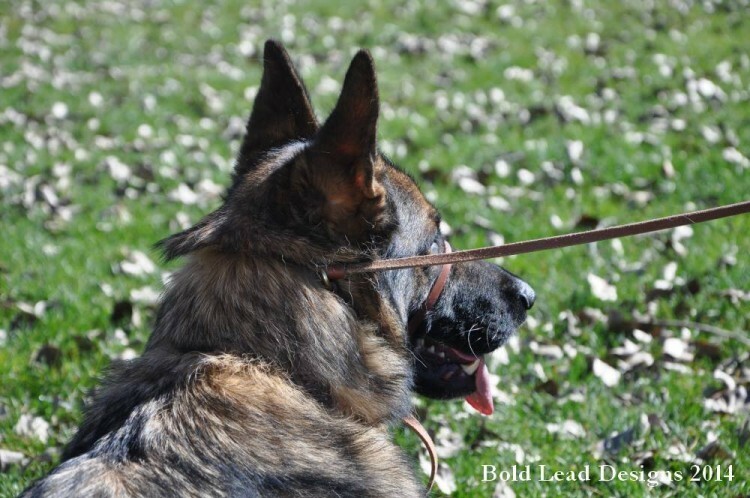 The only drawback when comparing to the Gentle Leader is that you don’t have QUITE as much control, since the lead control from the back of the head. Don’t think you’ll miss it though. Highly recommend.